NEW YORK, Nov. 14, 2018 /PRNewswire/ -- OUTFRONT Media Inc. (NYSE: OUT) today announced its OUTFRONT Social Influencers program, which gives brands of all sizes the opportunity to incorporate social influencers as part of their out-of-home (OOH) campaigns through OUTFRONT's internally sourced social influencer network and its partnership with social influencer platform WeAre8. Baked goods company Bauducco Foods USA is the first brand to execute a campaign that leverages the new program, enlisting social influencers of all different verticals to share Bauducco's brand story and moments of delight with hungry consumers. 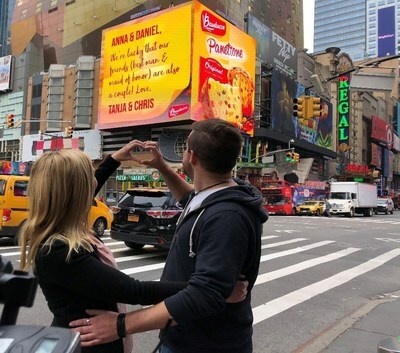 As part of Bauducco's annual holiday video campaign, the company took over the Cube, a 4,000 square foot full-motion display in Times Square New York, where the brand encouraged onlookers and online influencers to share holiday messages with their loved ones to be displayed in real-time on the digital screen. Bauducco's creative agency Samba Rock created and produced this activation, capturing video of the content. The emotional video will be pushed out via the OUTFRONT Social Influencer program and Bauducco's owned digital channels to be shared and promoted across social media this holiday season. "Our company's mission is to create moments of happiness between families and this is what we wanted to portray in our campaign ahead of the holidays. OUTFRONT understood this from the very beginning," said Erik Volavicius, Marketing Director of Bauducco Foods USA. "With its range of innovative offerings, we were able to share moments and stories of love from people of all backgrounds and homes to the world." Supported by some of the world's best creators including Shepard Fairey and a database of more than 9 million influencers and 25 million nano-influencers across all genres, partnering with WeAre8 allows OUTFRONT to extend its influencer engagement by presenting brands with the opportunity to not only highlight their campaign creative in new ways, but to extend the reach of their OOH campaigns to new audiences through a robust network of real people and real interactions online. "The impact and reach of OOH goes far beyond the physical assets where brands display their messages; brands who work with us regularly report organic web and social traffic resulting from their OOH campaigns. The OUTFRONT Social Influencer program exists to take this a step further, and give brands of all sizes the tools they need to more directly connect their offline advertising to online channels," said Jodi Senese, Executive Vice President and Chief Marketing Officer of OUTFRONT Media. "Brands are always looking for ways to amplify their messaging and our new Social Influencers program allows them to do that in a measurable, innovative and interactive way." "In a world where brands are looking for an emotional connection with consumers, we extend the powerful impact of the OUTFRONT campaign, by leveraging the reach and authenticity of passionate human voices at scale," said Sue Fennessy, Founder and CEO of WeAre8. "Micro-and Nano-influencers are effectively an extension of the media channel, and when thousands of people create and share their video stories in front of the campaign, we drive significant, additional ROI for the brand. Bauducco's 'stories of family love' invite some exciting storytelling and we are thrilled to be part of it."